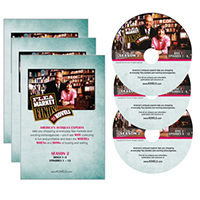 These DVDs include the fourth season of the HGTV series “Flea Market Finds with the Kovels.” You’ll see bottle cap art, human hair jewelry, old doorknobs, collectible pennants, antique axes and chisels, Staffordshire transferware plates, lithographed fruit plate labels, vintage Halloween decorations and costumes, antique toothbrush holders, and more! — 4 DVDs, 12 episodes in total. Get the complete Season 4!